We don’t know about you, but we can’t believe the first week of April is already over. May will be here before you know it, along with everyone’s favorite holiday to kick off summer – Memorial Day. This is the official celebration to welcome summer, and we can’t wait! Celebrate Memorial Day in Destin at one of our favorite vacation spots – Jade East Towers condos in Destin, Florida. Our lodging partners Southern Vacation Rentals have availability left for your Memorial Day vacation in Destin, but don’t wait to book! See more pictures and availability here! One of the best features at Jade East Towers in Destin is its location right on the water. You can step out onto the private beach walkover at your leisure to experience our famous sugar white sands! Just stretch out your beach blanket, grab your sunglasses, and start relaxing! With miles of sand to enjoy, you can also set up a game of flag football or beach volleyball. In addition to fun at the beach, there is also fun to be had at Jade East Towers condos in Destin. Community amenities include a beachfront pool, hot tub, and fitness facility. Tennis lovers will enjoy having courts to practice their serve on, while any kids in your group are sure to spend all of their time at the arcade. Each Jade East Towers condo features all of the comforts of home, including full kitchens, free WiFi, and more. Expansive balconies overlooking the Gulf are sure to quickly ease you into a vacation state of mind. 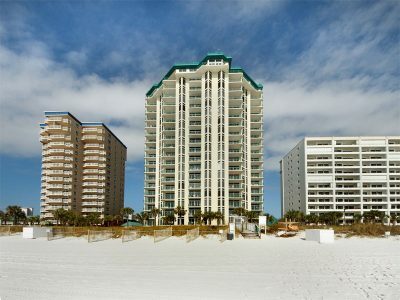 Jade East Towers also enjoys a fabulous location in the heart of Downtown Destin. You’re closer than you think to area attractions, including family-friendly spots Big Kahunas and The Track. Harborwalk Village is also just a short drive away, with more opportunities for fun. Live music, fun events, and local color await! Discover award-winning shopping and dining in Destin as well. There is certainly no wrong way to have a vacation here! Book your vacation condo at Jade East Towers today!